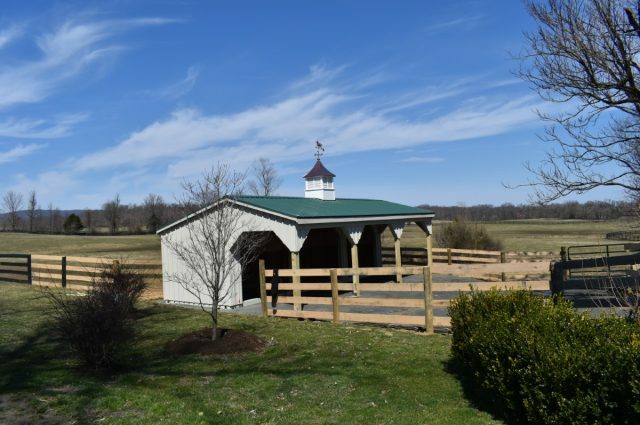 Treat yourself to a selection of custom built Amish barns designed to your specifications and add additional features and functionality as you wish. 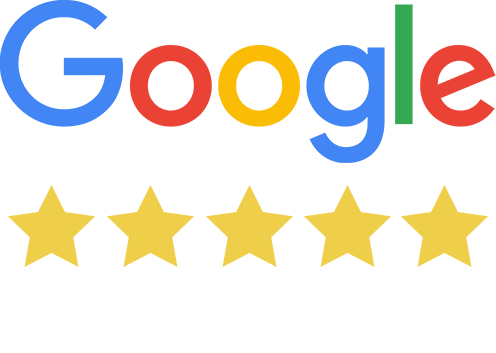 You select the size, style, color, materials, roof, floorboards, and everything in between. 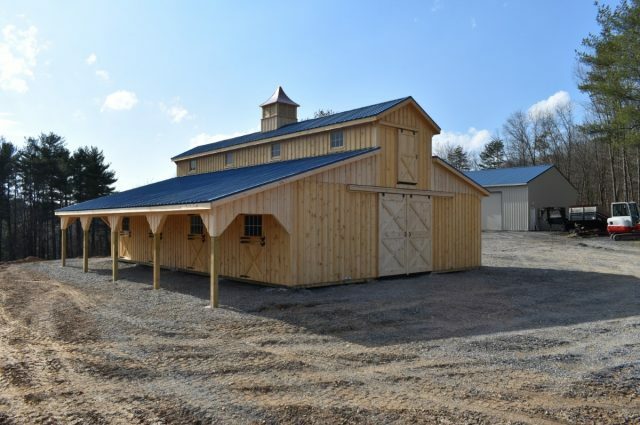 J&N Structures manufactures the finest quality custom horse barns built by Amish master craftsmen and sold through a network of dealer distributors in the Eastern United States including South Carolina, North Carolina, Virginia, Maryland, Delaware, New Jersey, Pennsylvania, New York and the remainder of all New England States. Creature comfort ranks high on the list of human needs, and this is the least our horses deserve. We want them warm in the winter and cool in the summer. Locate a place on your property where there is a nice breeze and then plan on where the barn needs windows. Also, remember that the structure requires easy access for vehicles to haul in hay and feed. 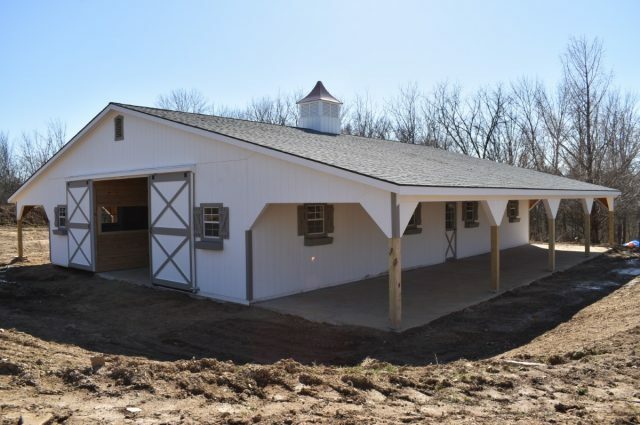 Now decide on a convenient place for the feed and tack room and an area for bathing the horses. Once you have the fundamentals marked off, extend the measurements for the length and width of the entire structure. 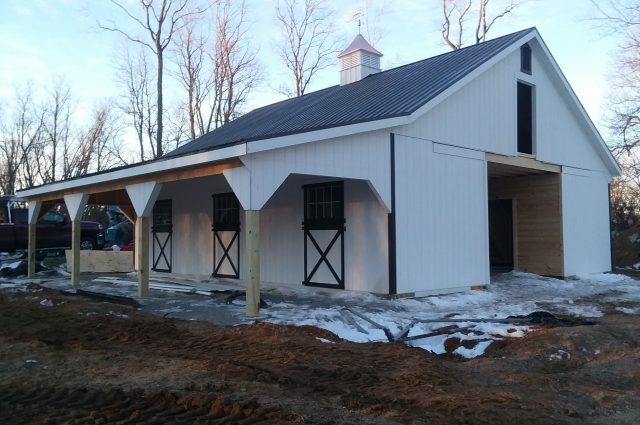 Let Us Build Your Amish Built Custom Horse Barn for You! 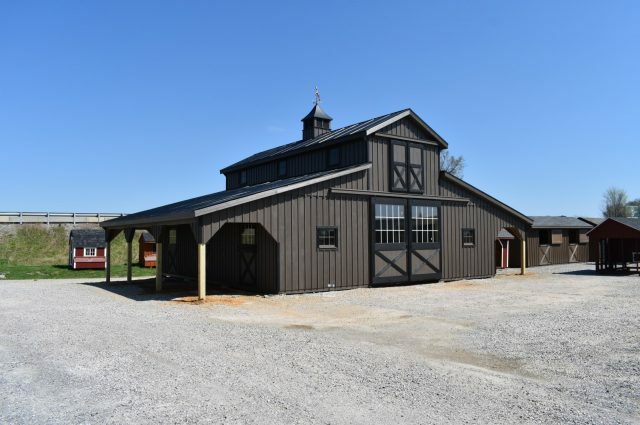 Built by authentic Amish craftsmen, each of our structures is crafted with a unique personality, creating an aesthetically pleasing horse barn that is distinctly your own, sure to enhance any property. Whatever you need, you can have it – doors or windows in the front, back, or side, partitions or no partitions … you name it, we can do it. Artists love sketching and capturing these barns on canvas because these horse barns built by Amish carpenters instantly bring to mind the Old Homestead ideas of Norman Rockwell paintings. They are usually the most popular and affordable to construct and provide aesthetics and convenience for both horses and humans. 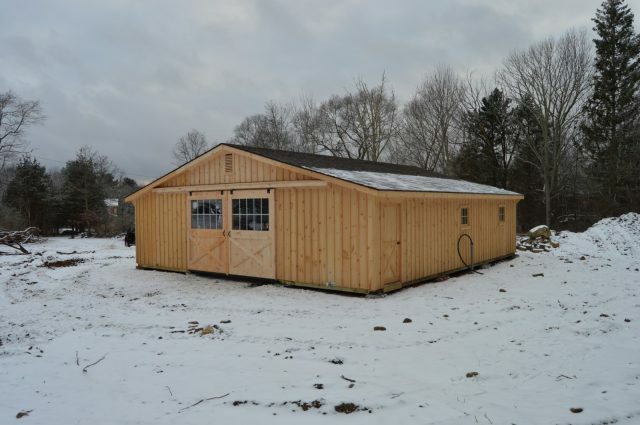 Also, these Amish barns are easy to customize for the owner by adding additional sections. As a result, the dimensions are limited only by the amount of available room on your property. 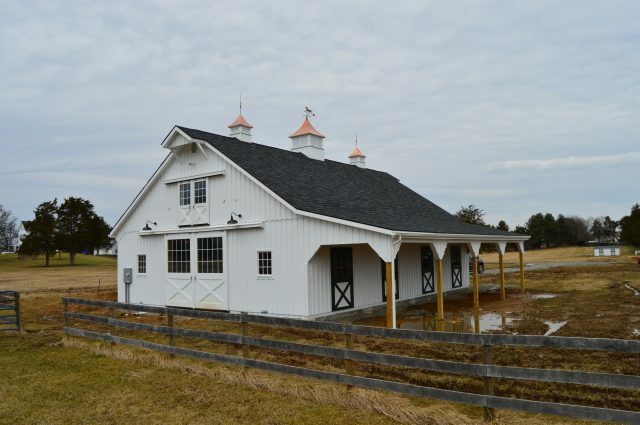 Customized roofs allow you the liberty of creating a horse barn with a loft, or partial loft, or no loft at all. 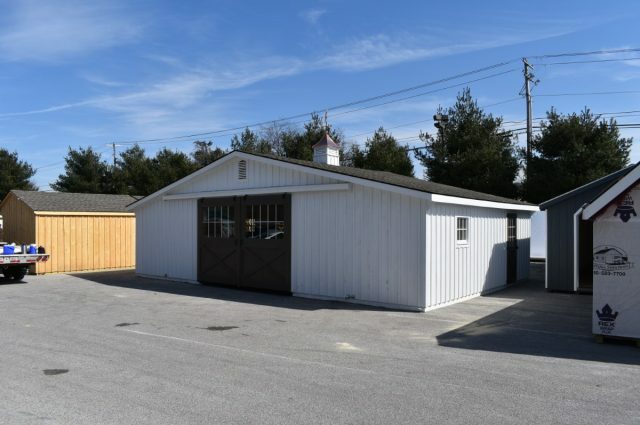 Feed rooms with convenient off-loading access, Kick-thru wall guarantee, well-equipped grooming area and tack rooms positioned wherever your needs, and meeting rooms for riding clubs are just as easy to accommodate. Provide us with a drawing of the barn you want and we will create a printout of blueprints for your approval. 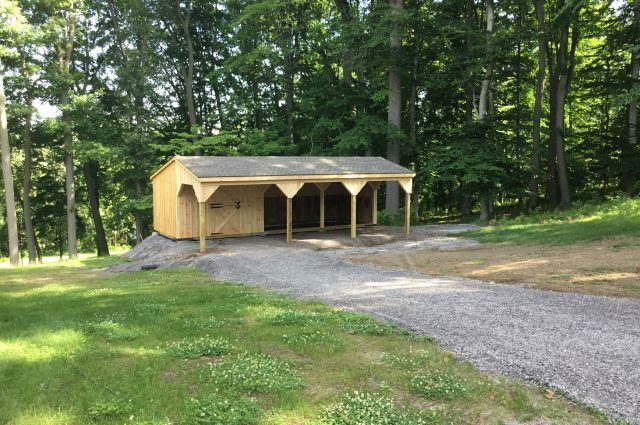 Our lean-to horse barns are the familiar style typically built with a large front overhang that prevents rain, snow, and sun from reaching your prize equines. The stalls stay dry and clean while offering plenty of room for each horse to stand and lay down without danger of injury when they rise to their feet. 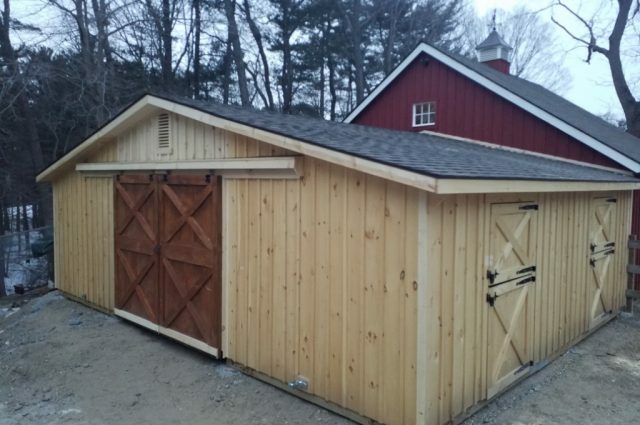 We can customize these Amish horse barns by adding a tack or storage room across one of both ends to further enclose the horse from the elements. 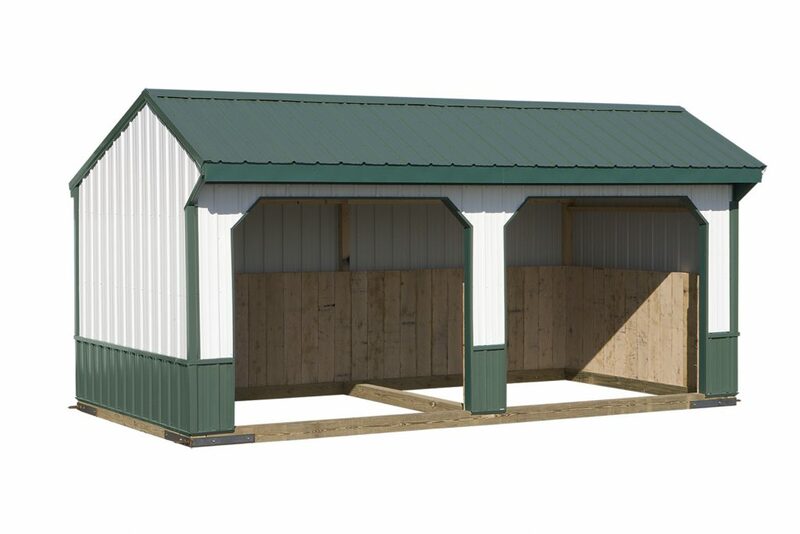 With our run-in shed, the horses have the protection from the weather, with or without individual stalls. These Amish barns make an excellent choice for pastured horses or breeding stock, who need shelter yet primarily graze off pastures. Our customers also have the options of adding unique features and modern colors, trim and partial enclosure. We also offer an assortment of accessories to consider when adding those special touches that make your horse barn different than others. If you have personal items from another location or handed down through the family, we consider them customized finishing touches, too. 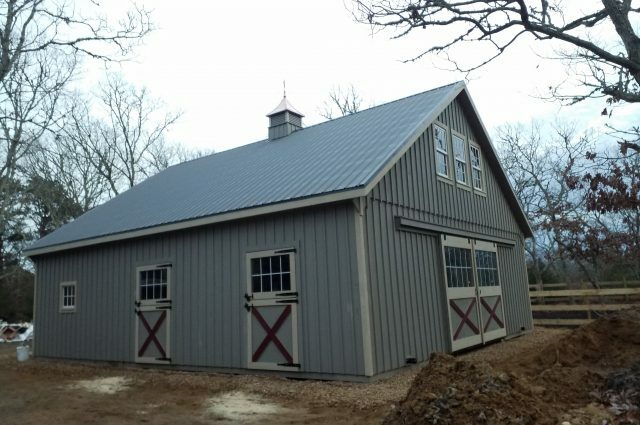 All our horse barns have an available choice of either shingle or metal roofing with nine different color options of either material. For the exterior walls made of high-quality lumber, we offer a choice of 4 wood stain colors to prolong the life of the modular barn. 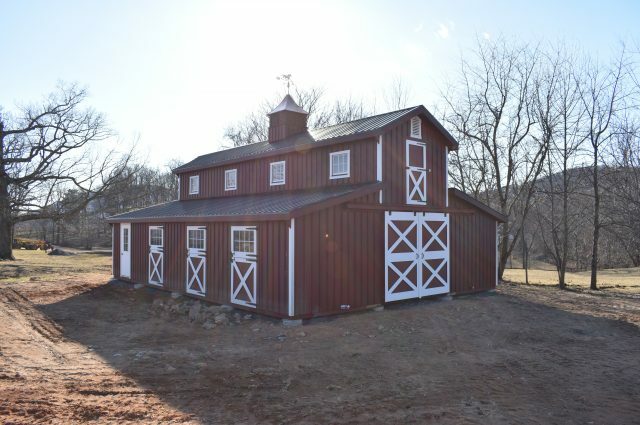 Horse barns built by Amish artisans carry the reputation of top-quality workmanship and distinguished style that last countless generations. For more information, visit our gallery or use the handy Dealer Locator and enter your Zipcode for an authorized dealer near you. I just can’t say enough good things about you and your company. You are truly a godsend. I wish many more companies would be as helpful, knowledgeable, honest and hard working as you and your staff are. 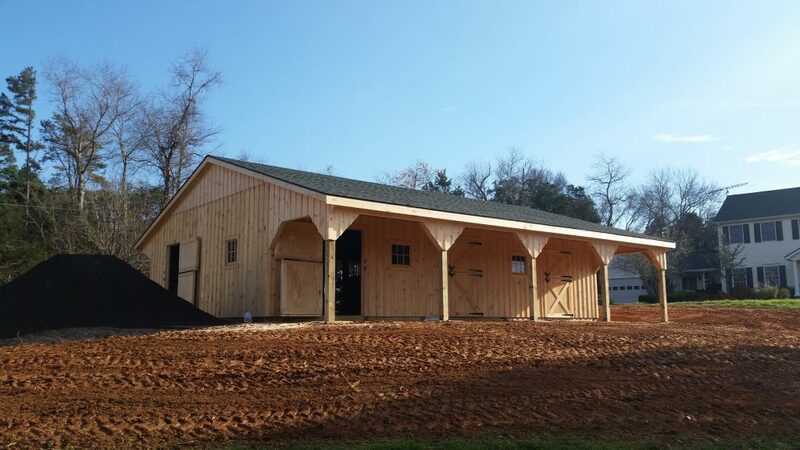 I appreciate all the effort you put forth in making my barn a first class building. I, as well as everyone else who comes here, certainly see the quality of craftsmanship and thought that went into the construction I already have had many people inquire about boarding their horses here.